If you have ever heard of Cojimar, a small fishing town on the outskirts of East Havana, it is probably because of Ernest Hemingway. “Papa´s” passion for fishing, and drinking, has left an indelible mark on this piece of bucolic Caribbean seaside. You can visit the bar where he drank at and the dock where he kept his boat, the Pilar. If you also happen to have lunch at the restaurant Café Ajiaco, you will probably leave convinced that had this place been around when Hemingway was in town, he would have dinned there as well. From the very start, Café Ajiaco is a place trying to stand out from the Paladar crowd while offering a 100% Cuban ambiance. They know by the time you get to their restaurant, you have probably already sampled more than a few mojitos and daiquiris. So they mix it up a bit with dark rum mojito sweetened with honey instead of sugar. Their cucumber daiquiri is even more ambitious, and delicious. The person sitting next to you will want to try your drink, so it comes with two straws. If you order beer or a bottle of wine it is delivered to the table in an ice pail. Nice touch. The fare is as varied as the drinks, but given that you are so close to the coast it is almost mandatory that you go for some seafood. The choice of fish changes daily with the catch, but reliable constants are pargo, a moist mild white meat and castero, which has a darker fishier taste. The former is served as grilled steaks stacked three high on top of sautéed vegetables. The latter is best taken fried which Café Ajiaco complements with three sauces for dipping: pineapple, tart homemade mayonnaise, and caper. If fish isn´t your thing don´t feel like you have to settle for another meal of pork or chicken. Check out the last page of the menu, which offers a selection of pastas made from scratch in the kitchen. I was very hesitant about the ravioli, as there are few places in Cuba that even come close to passable Italian food. However, Café Ajiaco does an al dente cheese and meat ravioli with an alfredo sauce that is an excellent break from the otherwise predictable choices. Once you finish your meal, I suggest trying to fit in dessert. The chocolate cheesecake is something you probably won´t find anywhere else during your time on the island. From Café Ajiaco, it is a few short block downhill toward the sea. There you can check out the local vibe (lots of bench sitting and dockside fishing), along with Hemingway´s drinking and fishing holes. Even though Cojimar is less than ten miles from Old Havana, the brisk transition from the gyrating busyness of a modern day Cuban population in a Spanish colonial city will remind you that you have been living life a little too fast. It is the perfect setting for strolling, conversing, and freeing up all of your senses to take in some really great Cuban cuisine. 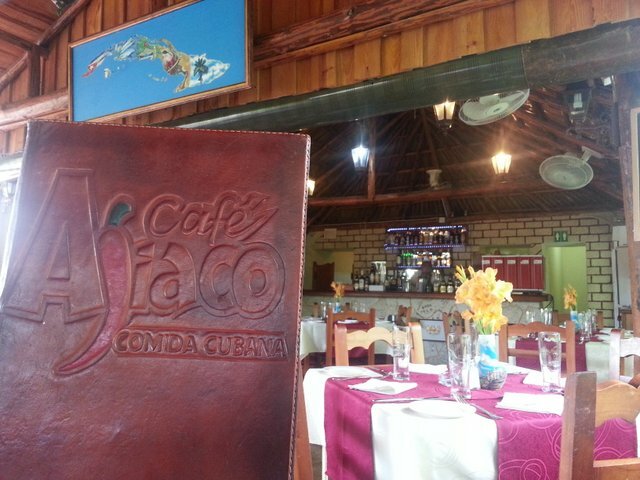 Cafe Ajiaco is located in the sleepy town of Cojimar in East Havana on Calle 92 No. 267 between 5th and 3rd. Phone number (7) 765 0514.